Heat oven to 180C/fan 160C/gas 4. In a flameproof casserole, heat the oil, then sizzle the bacon for 5 mins until crisp. Turn up the heat, then cook the lamb for 10 mins until brown. Remove meats with a slotted spoon, turn the heat up to maximum, then add the onions, carrots and mushrooms. Cook for about 5 mins until starting to colour, then stir in the flour. Return the meat to the pan with the herbs, and pour over the wine, stock and Worcestershire sauce. Season, then cover and braise in the oven, undisturbed, for about 1 hr 20 mins. After about 1 hr, make the topping. Tip the flour and herbs into a large bowl, then season with salt and pepper. Add the butter and mix using a fork. Make a well, then add the lemon juice and 3 tbsp water. Gently bring together to make a soft dough. Roll out on a lightly floured surface to about 5mm thick, then cut into rounds using a 7.5cm pastry cutter. Re-roll the trimmings, then cut out more rounds until the dough is used up. 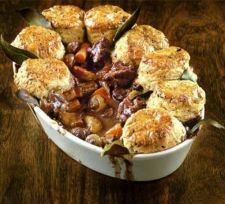 After 1 hr 20 mins, take the casserole from the oven, remove the lid, then arrange the circles of dough, overlapping, around the edge of the dish, sticking bay leaves between them. Brush with egg and bake for 45 mins until golden.